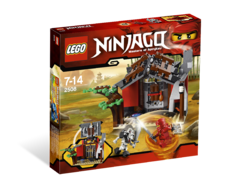 2508 Blacksmith Shop is a Ninjago set that was released in 2011. This set includes a roof that is hinged to provide a rack for the swords and other accessories on the underside of the roof. It also includes the map of the golden weapons. As you lift the roof, the rack will spin and reveal another side of weapons. The real name of the blacksmith shop is Four Weapons. The set also contains a gold katana which could possibly be the Sword of Fire, though a new mould is set to be released with 2254 Mountain Shrine and 2507 Fire Temple. It contains 9 weapons and two minifigures, Kai and Kruncha. The shop appeared in the LEGO Battles: Ninjago video game, both in the ninja and Skulkin stories. In the ninja story, you begin the level as Sensei Wu, who is on his way to see Kai at the shop. In the Skulkin story, you begin the level as the skeletons, who are out to take the map to the Golden Weapons. This is achievable by smashing the shop. This is a description taken from LEGO.com. Please do not modify it. (visit this item's product page) Defend the map to the golden weapons at the Blacksmith Shop! General Kruncha has busted into Kai’s blacksmith shop to steal the secret map with the location of the 4 golden Ninjago weapons! Help Kai to fend him off using the Blacksmith Shop’s hidden arsenal of weapons– Spinjitzu style! Set includes 4 weapons and a chicken leg. Lift the roof to rotate the wall and reveal a secret stash of weapons! Cook the chicken or sculpt swords in the fire! Facts about "2508 Blacksmith Shop"
Defend the map to the golden weapons at the Blacksmith Shop! This page was last edited on 24 April 2019, at 07:52.